Welcome to the Dream Palace Skrill Casino! To give you a head start, if you deposit a minimum of £/$/€ 10 using your phone, you will receive a 100% match up bonus up to £/$/€ 200 to play with at our Skrill Casino! Use Skrill as payment method and get your 100% match up bonus! Using Skrill at Dream Palace Casino unlocks over 400 games to enjoy! 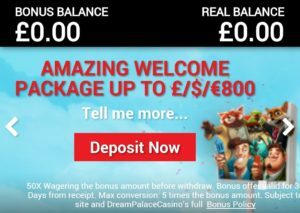 Double your first Skrill Casino deposit! Dream Palace Casino gives you the freedom of playing on any device, everywhere! By creating an account and select Skrill as your preferred payment method, you receive a 100% welcome bonus up to £/€/$200! For instance you deposit £/€/$10 using Skrill. 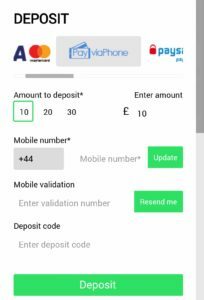 When the deposit is completed, you will find get another £/€/$10 as a bonus in your account to Play with your 100% match up bonus! Dream Palace has the broadest supply of Mobile Casino Games anywhere. Follow these three easy steps below and start playing instantly! See that text on the top right of your screen saying “Join now”? Just click it and fill in the form! Be sure to fill in a correct phone number, we need that to verify your account for any withdrawals! Now, Let’s make a deposit and claim that bonus! You received a text message from us containing 4 digits as a verification code. Fill those in now. Now you see a list of payment options. Choose ‘Skrill’ from the list. Typ “I acknowledge the above information” and submit. Boom! You are now ready to play over 400 games with your 100% match up bonus up to £/€/$200 on your deposit! Play and enjoy!